If only there was one lease agreement that would work perfectly for every landlord and every rental property. But in fact, lease agreements must be tailored to the individual rental property and the individual landlord’s policy preferences. That can create confusion over what needs to be in the tenancy agreement. The tenancy agreement must be specific to the property and the parties — the landlord and tenant or tenants. Provide an address for the property and the names of the landlord and tenant. While that seems simple enough, some landlords make mistakes at this point. For instance, the name on the lease may not be the tenant’s legal name, and that can cause confusion when trying to enforce the lease. Make sure the names match the photo ID. Also, include all adult occupants. It’s generally not a good idea to rent to one tenant when more than one person will be living in the rental. While the parties typically are identified in the body of the lease, this provision also affects the very end of the lease — the signatures. It may be difficult to enforce a lease unless all of the parties identified also sign the document using the names listed in the lease. A closely-related provision is to limit the lease to residential use only. That prohibits tenants from running an in-home business without clearing it with the landlord. Provisions that involve money must be carefully crafted. All fees, charges, and rent have to be detailed. The language regarding security deposits should be segregated from other times like rent, and these amounts must be stated clearly. Landlords can get into trouble by lumping fees together. Another common mistake is failing to complete the blanks in a standard form. Make certain all amounts collected or owing are listed in the agreement. Tenant responsibilities under the lease agreement will vary from one property to another. Never assume that the tenant will know what to do. Spell it out. This language should focus on the day-to-day management of the property, and incorporate the landlord’s policies. Who pays utilities? Who shovels snow? How will you curb noise? What about pets? Smoking? When deciding what to include, it’s important to consider how these provisions will be enforced. Let’s say the tenant has a duty to keep the property clean and orderly. That can be enforced through routine property inspections. If the tenant is aware of that provision and the regularity of the inspections, he or she is in a better position to comply. Given the recent popularity of short-term sublets, it is more important than ever to include policies in your lease regarding tenant guests, including any prohibitions on sublets, and the right to run a tenant background check on long-term occupants. A common mistake with this portion of the lease is demanding tenants give up rights provided by local tenancy laws. One example is forcing tenants to waive the right to notice before the landlord can enter the property. The intended rental period is an important provision. Once the lease expires, special rules may come into play that govern the timing of notices and other events like rent increases. Some standard lease forms provide for automatic renewal. This provision only works if the tenant is great. Otherwise, it can prolong the pain of a tenant from hell. Rather than defaulting to a month-to-month tenancy, allowing the option of renewing the lease for another full term has significant advantages. First, that provision allows the landlord to boot a bad tenant at the end of the original term without having to file for an eviction. Also, full-term renewal boosts cash flow by giving the landlord control over the timing of the next planned vacancy. By including a provision that warns tenants what could happen if they misbehave, you provide security to good tenants while deterring bad tenants who otherwise would test the limits. The most common remedy is eviction. But that is an expensive resolution, and won’t work in every case. A basic rule of thumb with remedies is that the landlord must be prepared to take whatever action is threatened. So it’s important not to include provisions that violate local rental laws or that would be onerous to enforce. The rules must apply to all tenants uniformly, and if applied to one tenant, must be applied to all in that situation. These rules should keep your properties functioning, but not be so persnickety that they eventually disqualify virtually all of your tenants. Any disclosures or policies, such as a crime-free addendum or no-smoking rules, can be listed on separate pages. However, these pages should be made a part of the lease as exhibits. It is extremely helpful if these items are referenced by title. It’s equally important that the references within the lease match the pages attached. A very common leasing mistake: referencing exhibits that are not attached to the tenancy agreement. Tenants are left in the dark, and can’t comply. Multiple occupants present a particular set of challenges when drafting a lease agreement. There should be only one lease per unit rented, regardless of how many occupants. However, it may be necessary to modify a standard, single-renter lease in order to contemplate roommates. For example, a provision explaining joint and several liability should be included to avoid a dispute should one of the tenants choose to move out. 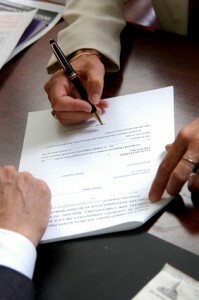 Extra signature lines may need to be added in order to accommodate all parties.